Daratif is a charming guesthouse with a patio and terraces overlooking the the atlas mountains. There are 1 bedrooms each decorated in a different style and with a specific atmosphere. You can participate in the daily life of Marrakech, of Valley and visit the markets, gardens, go to the hot baths or sample the finest of Moroccan cuisine in the local eateries. Bus of Marrakech center to Dar ATIF: 0. 6 euros/person (each 15 minutes). 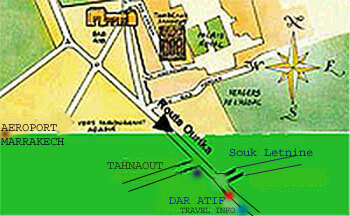 Taxis entirety(4person) of Marrakech to Dar ATIF: 7 euros(4 person). For more than 15 days of stays a handing-over of 10% will be applied. guesthouse in a garden with a patio and terraces overlooking the the atlas mountains. There are many activities on offer close by and various walks in the beautiful surrounding regions. Discover the Ourika Valley, the Atlas mountains regions and ancient traditions. You may cancel your booking up to 48 hours before arrival. Please do so directly with the relevant travel services provider. In the event of a no-show without cancellation, the travel services provider has the right to charge your credit card for the first night's stay where you have booked accommodation with such service provider, or for the full price of the tour or other non-accommodation travel service in accordance with the travel service provider's terms and conditions. It is the travel services provider's responsibility to provide you with the travel services. service of reservation is debited by instantworldbooking, the rest of the payment is regulated at arrival in cash. Daratif is with the km 30 in direction Oukeimden starting from Marrakech .